This sack race bag set is made with premium material with super refined stitching. The Potato Sack Race Bags for any occasion and for kids of all ages. Racers put both legs into the sack and hold the top of the sack up around their waist. Then see who hops the fastest!Suitable for adults and children. - Race Bag Size L: Three Color: 74 x 38cm. One Color: 70 x 42cm. - Race Bag Size S: Three Color: 56 x 28cm. One Color: 57 x 35cm. - High Quality: Not easy to break. - Durable to Use: Wear resistance for resusable use. - Perfect bean bags for sand game of kids at school. 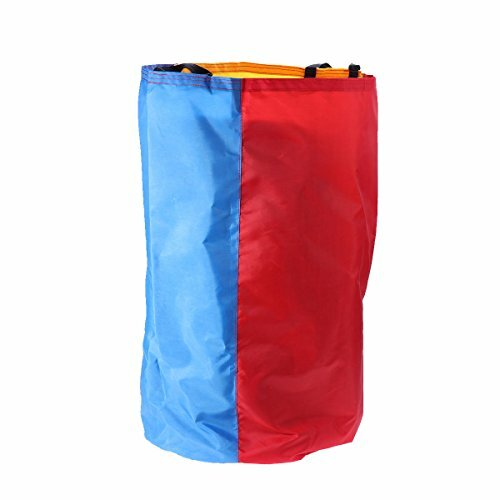 - Widely Application: Perfect sack race game bags for both children and adults. Can be also used for stowing other items when not in use. - Have a huge fun with your friends or families. High Quality: Not easy to break. Durable to Use: Wear resistance for resusable use. Perfect bean bags for sand game of kids at school. Widely Application: Perfect sack race game bags for both children and adults. Can be also used for stowing other items when not in use. Have a huge fun with your friends or families.